On the 3rd floor of the exhibit it shows the planning projects for the World Expo 2010 which by the way will happen in May. They even have some miniature models of the different architectures from other countries. Bird's eye view of Shanghai. When you look closely you will noticed a red border line that serves as a division of the city. I was able to see that line when I was on board on the plane going back to Manila. As my sister told me, the city of Shanghai was well planned by the government when it comes to it's structures, construction, etc. This will be the China Pavilion for the World Expo Exhibit. My sister said that the construction for this structure already started and in progress. This one is so futuristic and looks like a UFO spaceship...hehehehe. I'm not sure is this is a Science Museum. I forgot what building it is. My sister took a photo of the Malaysia Pavilion. When you see it in actual, it is very unique and Asian. I wonder how it looks like when it's already build. You will be amazed on how they did this diorama of the whole Shanghai. I can't help but exclaimed over and over again that the city is huge! The last floor which is the 4th floor, boasts the future plans of Shanghai and it's mission to be one of the Eco-friendly city in the world despite it's rapid economic progress. During my stay there, I noticed that there are a lot of trees on the streets compared to Manila. Furthermore, the streets are clean. Top view of the Shanghai diorama from the 4th floor. I told you that the city is big. My sister told me that the city's airport is massive. I'm not sure which of those two parts are the ones that are already build but I agree with my sister that it's really spacious. If it will be compared to NAIA's Terminal 3, ours will be 1/4 of the size of their airport (no kidding). As promised, here is the continuation of my Shanghai vacation. February 14 (Sunday) - It's Chinese New Year and Valentine's Day. The weather forecast for that day however is not fit for the two celebrations. It's going to be a rainy Sunday.Ugh! So my sister decided for us to visit anything that is indoor in Shaghai. I was thinking of the Shaghai Museum but my sister told me that she got feedbacks from her officemates and they say that it's the typical museum that displays the arts, artifacts, culture, history, etc. of Shanghai. So my sister cancel it out from our itinerary. Instead we went to the World Expo 2010 Exhibit located in Nanjing Road. World Expo has been a tradition of international fairs and expositions and for this year it will be held in Shanghai. The screen above shows the ad (I think) for the World Expo Exhibit. Honestly I didn't pay much attention...hehehehe. View of the ground floor from the second floor. You will notice a blue character on the left side of the picture. That is HAIBAO, the official Shanghai mascot for this year's World Expo Exhibit. On the center is the famous buildings found in Shanghai. Now let's move on the the 2nd floor where they have different photos of what Shanghai looks like in the early 90's. They even have a comparison photos of the past and present. It will show you how far Shanghai had achieved to be a progressive city that it is today. If I'm not mistaken, the backdrop picture is the glimpse of Central Shanghai where the Bund is located. See the plain fields on the lower part of the backdrop? These racks held the "before" and "after" photos of Shanghai. You have to pull each one of them from the side of the box. Before I launched to the continuation of my story about my adventures in Shanghai, a sudden thought came over me of wanting to have a 1tb hard drive I think it will be a good investment if I have one considering I have lots of pictures and digital scrapping materials in my laptop. It wouldn't hurt if my 500 GB external drive will have a companion....soon. This is a late post but there's nothing much I can do since the blogging websites and social networking sites in China are all blocked. Now I'm swamp wiht pictures and stories about my Shanghai rendezvous. My flight in Cebu Pacific was 8:20pm last February 13. Hubby and I are already on NAIA Terminal 3 at 6:10pm. I didn't hurriedly go inside since I know that we have a lot of time. I was having mixed emotions during that moment - nervous, excited, scared and sad. Nervous since I have no idea on what to expect when I arrived in Shanghai. Excited to see my sister and for the sight-seeing adventures we will experienced together. Scared since I will be flying alone and sad because the hubby will be left in Manila. Hubby is encouraging me to go inside the airport so as not to be late. I was really sad when I saw him standing waiting for me to emabrk on my journey. Sigh! Call me OA or whatever but that's what I felt and I just can't imagine what more will be our reaction if one of us decided to work abroad. That means a longer period of not seeing each other! Erase, erase the thought. Back to my story. So there I was in the Terminal 3 where I finally went inside to check-in my baggage and pay the travel tax. After which I have to go back to the check-in counter to get my board pass. Then I went on to the cashier to pay for the travel tax (sigh! so many taxes you have to pay here). I headed to the immigration where the guy on the counter is being arrogant (sort of) or his enjoying himself being an a******e for asking an authenticated invitation letter from my sister! He even suggested to have my sister faxed the letter in their office. WTH?! It's Saturday and it's nearing 7pm for goodness! Anyways, he let me through despite the hassle and harassing me with with his words. Obviously his making a good time out of me. Geeze! We boarded the plane 15mins earlier than expected. 3 hours and 10-15 minutes is the estimated traveling time. I find it too long. After 30 minutes on board, the crew held a Bring Me game. I didn't participate since I have no energy and enthusiasm. Good thing that my seatmates on the plane happens to be a Filipino as well. A mother and son. We chatted for half an hour before I took a nap. When I woke up, I still have an hour left to entertain myself. So I just flipped through Cebu Pacific's magazine and before I knew it we are arriving in Shanghai airport. As soon as our plane landed and steady to a halt, I immediately opened my mobile to see the sms of my sister. She's already waiting for me in 2A Gate. The passengers on our flight get passed through the airport's quarantine then to the immigration. Then lastly to the baggage counter. As soon as I get mine, I hurriedly went for the exit to where my sister is waiting. So happy to see her. She's all bundled up for the weather outside. Along with her is a cab driver who volunteered himself to take us back to my sister's place. His the same driver that my sister got to bring her to the airport. It was 5 minutes nearing 12 midnight and as we cruise along the highway, we can see fireworks in the air! It's like seeing different fountain of colors. Too bad I didn't get the camera to capture all of it. It was a fascinating sight. It was a 45 minutes travel from the airport to my sister's flat. It started to drizzle with rain with a bit of a snow regardless that didn't prevent the Chinese peeps in lighting firecrackers to celebrate the New Year including the guards on the Yanlord gate (condominium compound where my sister lives along with her two other officemates). It was really cold when we got out of the taxi. The clothes that I brought will definitely be a no match on the weather. It's nearing 1 am when we arrived. I changed clothes while my sister and I are exchanging stories. I think we slept at around 3am and we have to wake up early to start our escapade. It's a thin layer of snow outside. After 2 hours, it's all gone. When my sister woke up she immediately checked the weather on that day. It seems that it will be raining and no sun will be visible. We opted to visit museums or exhibits...anything that is indoor as we don't want to waste the day just staying inside the flat. So we get into action to get ready for the day! I'm back! Truly there's no place like home but my body started to feel the difference as soon as I step out of the NAIA Terminal 3 last Saturday. It was hot compared to Shanghai. Now I am nursing a few rashes due to the sudden change of the temperature and climate. I'm hoping that I will not get sick. Colds, coughs and flu is the last thing I wanted at this point. Boy oh boy, I got lots of stories to tell and pictures to share with regards to my Shanghai trip. Hopefully I can still remember the places we've gone to. Last week was exhausting but I enjoyed my visit there despite the negative degrees centigrade temperature. I survived the cold weather! The weather here is a big surprise for me! I'm used to the rainy and sunny weather of Manila. The temperature here is below 5 degrees celsius! Yesterday it even reached negative one and we are outside the comfort's of my sister's flat. Shaghai is a big city and one week is not enough to visit their tourist spots. Why I came to that conclusion? So far we only accomplished four (4) of the places we have to visit that my sister listed down. Friday night I will be leaving the city to go back to Manila. Where the time go? I made this last night when my creative juices are abundant...hehehehehe. I will be busy packing my things tonight so it's a wise decision on my part to create one early. For someone who is in a hurry (sort of), this one is not that bad, eh? 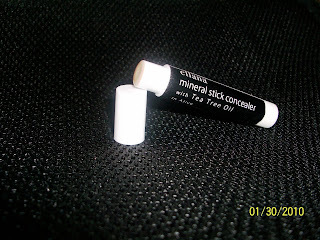 Learn the basics on how to apply mineral makeup, create different makeup looks, as well as useful tips and tricks on how to make the most out of your current stash. March 6, 2010 at Fifth Avenue Place, Bonifacio Global City from 3pm-5pm. Workshop will be headed by Mineraux’s founding partner, Melissa Vergara, a certified makeup artist by the School of Fashion and the Arts (SoFA) Manila. Limited to eight (8) participants per session only. 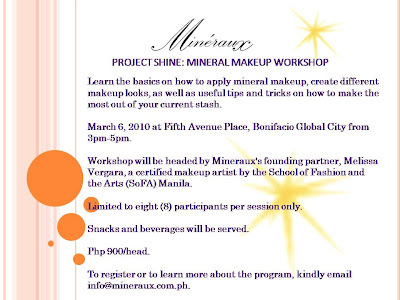 To register or to learn more about the program, kindly email info@mineraux.com.ph. I can't believe that tomorrow is my flight bound to Shanghai! Yipee! Right now I'm having mixed emotions - excited, nervous and sad. I would be really happy if the husband will join me on my trip. Tsk! Too late for us to book another flight for him for tomorrow. Definitely next time he will be part of the trip ;) Let's see...I have a lot of places on my list that I want to visit. Which one will be the next??? On a different note, when I get back here in Manila, I will be busy planning for my dear husband's birthday! He doesn't want to celebrate it but of course knowing me, I wouldn't let that day just pass by like ordinary days. I enjoy celebrating my birthday and I love being happy on my birthday so I want the same thing for hubby regardless if he objects =P Nothing fancy or extravagant. Just simply spending quality time with each other after being far apart for a week (cheesy!). Hmmm...We haven't watched Avatar yet (surprise?!) so definitely that one will be part of his birthday itinerary. Then I have coupons from my Belle de Jour Planner that I can use for discounts and freebies when we dine outside. I only need to choose which restaurants to go to. The White Hat will definitely part of the celebration. Thank goodness for the buy one get one coupon healthy yogurt treat ;) Sonja's Cupcakes will be present as well. My only worry is I need to go in Serendra which is a little off Makati. Maybe I should do it after his birthday....hehehehe. Oh boy, I can't wait to see the expression of my husband's face on what I have in store for him on his birthday. Geeze, it took like how many minutes before this page loads up! I can't believe that our internet connection in the office is so darn slow. It's weird considering that social networking sites + youtube are all blocked. Added info is the fact that many associates before are already gone (some resigned while others are retrenched) and the connection is almost comparable to a dial-up network! Either there is really a problem on the internet service provider or there is a problem on our end. Sigh! An IT company who has ongoing technical issues for quite sometime. Hilarious! Don't make me laugh. It's not funny. I would like to say my deepest thanks for those who take time to placed their votes with regards to the "new do" of my blog. I just got this article from World of Feng Shui and decided to share it with you. I'm not saying if there is such a truth behind the lines but well, you'd be the better judge of that. 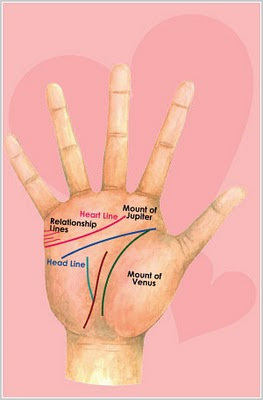 The heart line runs horizontally across the upper palm, surrounding the mounts of Mercury, Apollo, Mars, Jupiter and Saturn. This line indicates the strength of emotions, quality of relationships, timing of important relationships such as marriages and love affairs and whether these relationships bring happiness or heartache. Ideally, the heart line should be clear and without breaks This kind of lines suggests someone who will be the dominant partner in a relationship. Breaks in this line spell broken relationships, while islands along this line spell tragedies of a broken heart. Little lines that branch out above the heart line going upwards indicate strong and happy relationships, while lines that branch out below the heart line are said to be less fortunate. Secondary lines also indicate how busy a social life you have. The relationship lines by the side of the palm indicate serious relationships and some read these as marriage lines. The stronger and longer these lines are, the better. When relationship lines are missing, it suggests a difficulty in getting married, while several lines here indicate several love relationships. Two equally strong lines suggest two marriages. These are the generalizations in palm indications of your love life. Additional indications revealed by the heart line can be found here. I have to start packing the things that I will bring this weekend to Shanghai. As per my sister advise, I need to bring clothes that will keep me warm since it's still winter season in the city. I am looking forward of finding a pair of boots on the shops there. 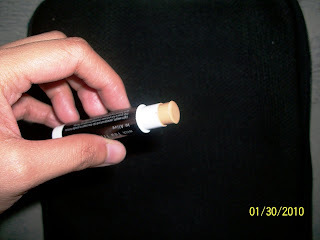 It will still come in handy here in Manila when it's rainy season...hehehehe. The boots sold here in Manila are still pricey (in my opinion though). Bought two pieces of turtleneck long sleeve blouses from Terranova last Saturday and it only cost Php 299 each! I was able to get the nice colors too. Good thing I decided right then and there to get it. The husband keeps reminding me that once I get there I have to make myself online on Yahoo Messenger every night so we can talk (chat). Awww...he will surely miss me for one week...and I will miss him too. 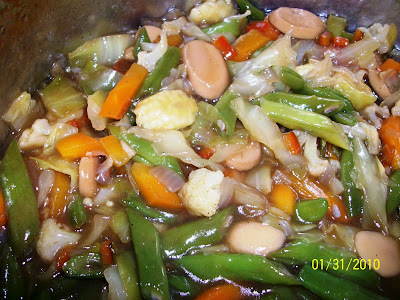 Last January 31st I decided to cook an all vegetable dish. I actually cooked this a whole year (++ months) back but my first attempt is not impressive at all. It's lacking of flavor and it's not appealing. Good thing that my husband is a very understanding one and his not picky when it comes to food (unlike me). What made me decide to try it again is my secret ingredient...ahahahaha! Well, it's a Mama Sita's Chopsuey/Pancit Canton powder mix. Since the powder is deliciously blended, how can I go wrong, right?! All I have to do is follow the instructions at the back which I can handle just fine. Looks delicious....but it is! Promise! Just by looking at the photo now I have this sudden urge to cook it again this weekend and why not? I still have another pack of the Mama Sita's powder mix. All I need to do is to buy the vegetables needed. It's so yummy and the husband loved it! How I miss the days that I have extra income readily available in my Paypal when I needed it. It's been a long time since I have a page rank here in my blog thus I have to search for an alternative that doesn't involve page ranks and such. I was playing with my settings in my Blogger account when I stumbled on Amazon Associates. Hey, this is new? Last year it was only Google Adsense. The curiosity in me wins, so I clicked my way to discover what it is. It actually had the same concept as Google. You can put Amazon widgets on your blog like Search, Deals, My Favorites, MP3 Clips and many more. Actually the widgets depend on the interest of your choice. Ohh...I love it! Still in doubt? Why don't you try it and see for yourself. It wouldn't hurt to try. Sign up now! That's right! 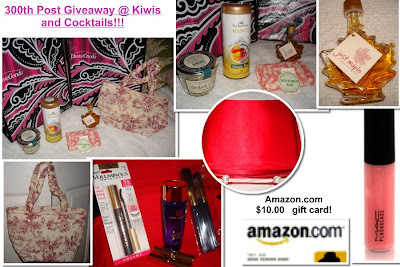 Ashley is giving away some cool items in celebration of her 300th post in her blog :) Hopefully I can do some contests of my own...that is once I have enough funds on my Paypal account or how about after my China trip? Let's see what happens. Anyways, the contest rule is plain simple. You just have to leave a comment here and you can also ask her a question if you want. Need more convincing? Alright, let me show you the items up for grabs! That's a lot of goodies right? So why don't you send her some love right now. 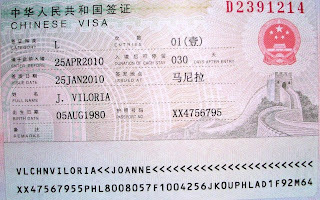 I finally got my passport together with the Chinese Visa on it! Yes!